Beta Phi Mu makes a variety of branded merchandise available for sale to our chapters and members. ​1. Lapel pins, honor cords, and leather bookmarks are available directly from Headquarters or via our online store. ​Show your pride in being a part of Beta Phi Mu! These brass-toned enamel pins feature the official Beta Phi Mu dolphin and anchor insignia. Image is enlarged for detail; actual size is .75 inch diameter and background is black. 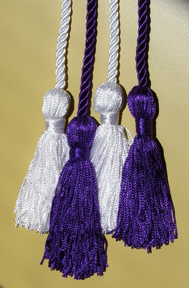 commencement, or other formal academic functions, you may also wear these cords with your regalia at those events. From Ameropean Corporation – this elegant, attractive bookmark will prove useful in your reading and remind you of your affiliation with Beta Phi Mu. Hot foil stamped, top quality leather bookmark. Size: 9" by 1.5". You may purchase these items by credit card, Apple Pay, or Android Pay directly via our online Store on this website. To purchase merchandise and pay by check, print and fill out a Product Order Form. Mail the completed form and your payment to Beta Phi Mu Headquarters, PO Box 42139, Philadelphia, PA 19101. Or contact BPM Headquarters if you would like to be invoiced to pay by PayPal or credit card. 2. We have an official Beta Phi Mu Shop on CafePress. Visit the Official Beta Phi Mu Gear store at CafePress for T-shirts, coffee mugs, key chains, and other official Beta Phi Mu merchandise featuring our official Greek letters designation and our official insignia. 3. 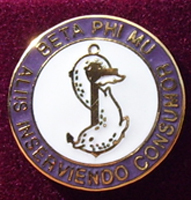 Other items of Beta Phi Mu jewelry, such as recognition pins, key chain pendants, and charms are available directly from our partner manufacturer, Award Concepts.